Hand dyed t-shirts are made with The Mountain's usual excellent quality water based inks that saturate each fiber of the shirt, so that they will not fade with washing. If you love wolves, you will totally love The Mountain's amazing Wolves, Animal and Wildlife tees. (Quality Durable 100% Cotton T's). The wolves look so real that you wouldn't be surprised if they jumped off the t-shirt. And the hand dyed t-shirts are made with The Mountain's usual excellent quality water based inks that saturate each fiber of the shirt, so that they will not fade with wash after wash.
My daughters are both very fond of wolves, so we are always looking for wolf clothing and accessories for them. When I found The Mountain and their wolf tees, I was very excited, because I have a very hard time finding clothes for my girls. Both my daughters just are in love with the wolf tees that they picked out, and are always asking for more The Mountain shirts. What I love is that I know the shirts will last through the numerous weekly washings. The colors stay true, and the prints do not fade. The shirts just stay beautiful. There are some beautiful wolf designs in The Mountain's Evolution line. My personal favorite is the tee to the right, the Wolf Tree t-shirt. This wolf shirt is printed on a midnight blue background with the wolf coming right out of the tree branches. But even in The Mountain's regular t-shirt line there are lovely tee shirts for men, women, and kids, including those hard to buy for teenagers. Beautiful Design With Many Different Pattern.Wonderful Gift For You And Your Friends. This Underwear Is Very Easy To Care For Since They Are Machine Washable And Tumble DryService First,customer Foremost.Perfect Gifts For Yourself,your Family And Your Friends. For werewolf fans, there are several The Mountain t-shirts that apply. Werewolves are usually associated with the moon, and The Mountain has designs with the wolves howling at the moon. Sometimes the moon is very much in the forefront of the design, but more often it is just a hint in the background of the design. The wolves faces are usually facing directly out forward or in profile on each shirt design. The Mountain Three Wolf Moon shirt has become famous as the tee shirt that will help men get women. 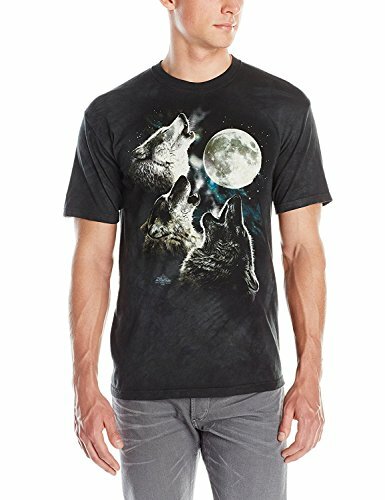 There is an entire saga of stories on Amazon about the success of men finding their girl while wearing the Three Wolf Moon t-shirt. So if you are trying to become more manly and handsome, just buy one of these Three Wolf Moon shirts from The Mountain, and you will be surprised at the result. The Mountain uses safe practices and water based ink on all of its t-shirts, but they also have a purely organic tee shirt line that includes the gorgeous Spanish wolf shirt to the right. On this t-shirt, the design is so intricate, that I didn't even realize that it was a wolf until it was pointed out to me. To me, it looks more like a Moroccan design on the front of the tee, but either way, I still love this t-shirt. The Mountain has a lot of wonderful t-shirts that will appeal to kids of any age. But teens are notoriously difficult to buy clothing for. If your teens balk at most clothing, you will find something that they will wear in this t-shirt line. If it is not the wolf tees, then look through the many other designs available. You can feel good about providing them with clothes that are made in a healthy environment, that will last through many washings, and that your teenagers will feel good and look good in. They may not tell you, but they will love these tee shirts. They feel better the longer you own them. Did you know that The Mountain T-shirt Company has an entire line of laugh out loud t-shirts called Life is Crap? I love these tees. Thomas Kinkade, a world renowned author and painter known as the Painter of Light, has teamed up with The Mountain, a United States based maker of high quality, artistic t-shirts. The Mountain dragon tee shirts show off your inner dragon with high quality materials and artwork. If you are looking for the best t-shirt available for a good price that will last a long time, and that everyone will love, then you need to look at The Mountain Evolution tees.